There are ten years of compulsory education starting at the age of six. Primary school comprises six years and secondary seven, with cycles of four and three years. Some 96.5 per cent of pupils complete primary school (2011). The school year starts in January. 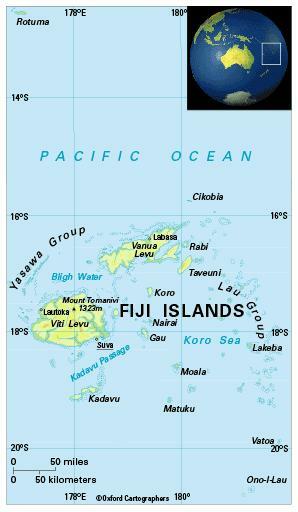 The main campuses of the regional University of the South Pacific (founded 1968) and the Fiji National University are located in Suva. The University of the South Pacific has further campuses in Fiji, at Labasa and Lautoka. The Fiji National University, formally established in 2010, was formed by the merger of seven tertiary institutions: the College of Advanced Education; College of Agriculture (Koronivia campus); Institute of Technology (Samabula campus, Suva); Lautoka Teachers College (Lautoka campus); School of Medicine (Suva); School of Nursing (Suva); and Training and Productivity Authority, and has many campuses across the country. The oldest of these institutions, the School of Medicine (established in 1885) and the School of Nursing (1893), were merged in 2010 to become the Fiji National University College of Medicine, Nursing and Health Sciences.